July 27, 2018 —Caribbean Sea (NNS) (NNS) — Senior ranking officers from the U.S. military and partner nations in the U.S. Southern Command area of responsibility embarked the Whidbey Island-Class Dock Landing Ship USS Gunston Hall (LSD-44) via CH-53E Super Stallion helicopter to observe the U.S. Navy’s support of Special Purpose Marine Air-Ground Task Force – Southern Command (SPMAGTF-SC) in a humanitarian assistance/disaster relief (HA/DR) mission rehearsal, July 20. 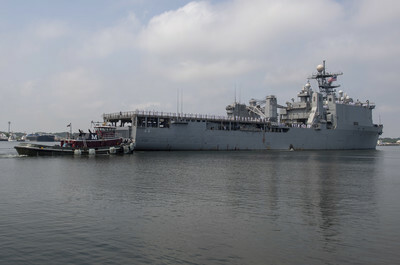 The group spent roughly 90 minutes on board touring the ship, speaking with senior leadership and learning about U.S. Navy humanitarian assistance and disaster relief assets. The exercise helps refine the U.S. Navy’s and SPMAGTF-SC’s procedures as they prepare to respond to probable natural disasters in Latin America and the Caribbean. The rehearsal also provides an opportunity to work shoulder-to-shoulder with partner nations with the intent of eventually developing a multinational maritime task force responsible for rapid response to man-made and natural disasters in the region. According to the ship’s Commanding Officer, Cmdr. Fiona Halbritter, the Distinguished Visitor (DV) Embark Program places key leaders from all sectors of society aboard a U.S. military ship. While aboard they meet the ship’s crewmembers and experience first-hand how the Navy is contributing to the security of the United States, and to the stability of the global community. The ship’s crewmembers spoke about the various components of shipboard operations and how the Navy and Marine Corps have demonstrated the viability and utility of jointly operated missions. Southern Seas is a U.S. Southern Command-sponsored and U.S. Naval Forces Southern Command/U.S. 4th Fleet-conducted deployment focused on subject matter expert exchanges with partner nation militaries and security forces in the Caribbean, Central and South America. For more news about Southern Seas 2018, visit www.navy.mil/local/cusns/, on Facebook at http://www.facebook.com/NavySouthernSeas, or on Twitter at http://twitter.com/USNSouthernSeas.